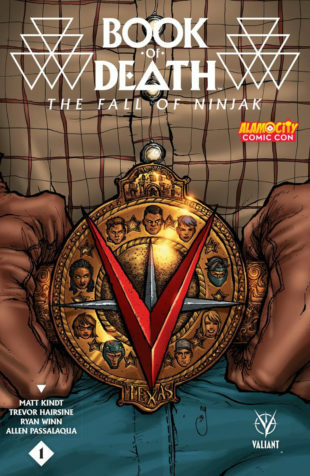 The Valiant 25th Anniversary Tour Brings BOOK OF DEATH, NINJAK, and More to Alamo City Comic Con in September! This September, Valiant is bringing its silver anniversary festivities to the third annual Alamo City Comic Con in San Antonio, TX – the Lone Star state’s premier pop culture convention celebrating comics, movies, TV, gaming and cosplay! From Friday, September 11th through Sunday, September 13th, visit Valiant at Booth #B5 inside the Henry B. Gonzales Convention Center for a weekend packed with Valiant panels, convention-only exclusives, and more from Valiant’s award-winning publishing line! 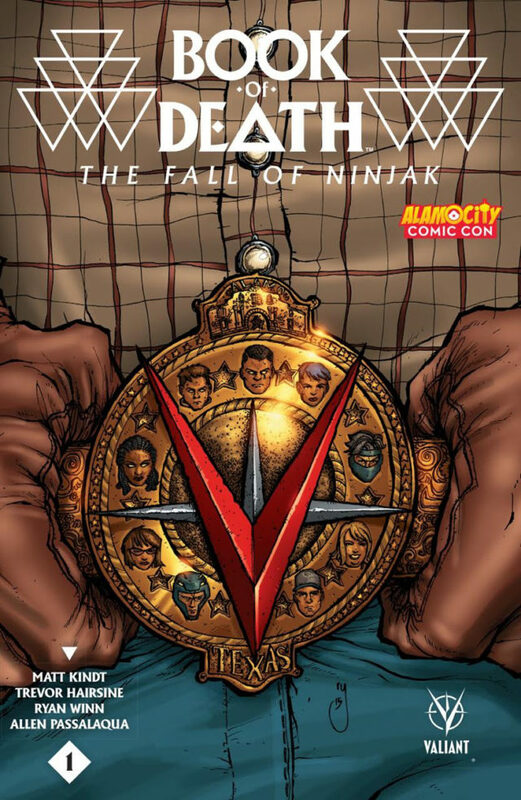 Find out why Valiant is the single most nominated comic book publisher of the 2015 Harvey Awards with a complete collection of Valiant’s critically acclaimed trade paperback and hardcover collections…and then check out our latest and greatest selection of sold-out new series with BOOK OF DEATH, DIVINITY, BLOODSHOT REBORN, and more – still available at the Valiant booth! Plus: debuting only in San Antonio, look for the BOOK OF DEATH: THE FALL OF NINJAK #1 Alamo City Comic Con Exclusive Variant, featuring an all-new cover by rising star Ryan Lee (Uncanny Inhumans)! Discover the never-before-revealed future of MI-6’s most elite operative – and the Valiant Universe along with it – with this special one-shot tale ripped from the pages of the summer’s most acclaimed comic book event from Matt Kindt (NINJAK, Mind MGMT) and Trevor Hairsine (DIVINITY)! Then, get ready for two all-star panel presentations featuring Valiant creators and staff! Still curious about where to start with Valiant? Join Valiant on Friday, September 11th at 5 pm ET in Room #204 for Valiant 101: The Story Starts Here – a step-by-step panel presentation detailing the origins of the Eternal Warrior, X-O Manowar, Bloodshot, Dr. Mirage, and more of Valiant’s top heroes and villains. If you’re new to the Valiant Universe, then this is the panel for you! Next up, on Saturday, September 12th at 4 pm ET in Room #204, get the inside track on all of Valiant’s silver anniversary plans with the Valiant 25th Anniversary Celebration! From BOOK OF DEATH and BLOODSHOT REBORN to the upcoming events of WRATH OF THE ETERNAL WARRIOR, find out what’s coming next for the Valiant Universe’s greatest heroes right here! 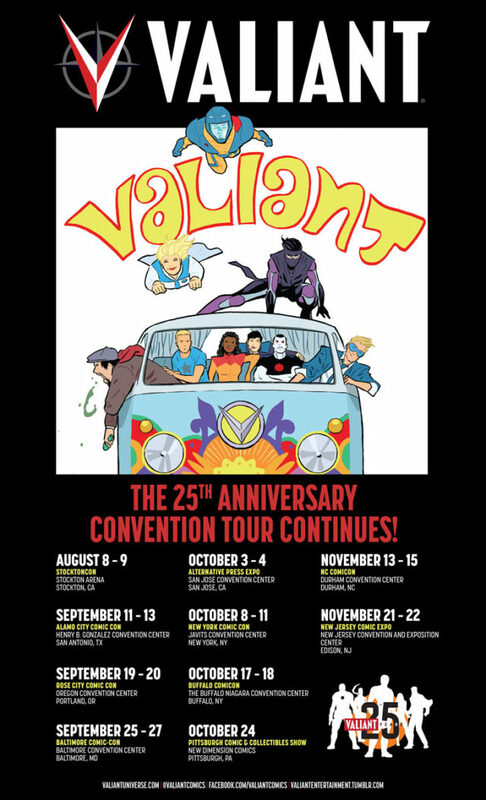 The Valiant 25th Anniversary Convention Tour is in full swing this September at Alamo City Comic Con 2015! We’ll see you in San Antonio!